Managed to beat the weather and make it up to Bridlington, Yorks to spend Christmas with family. Found time to take in some pillboxes while walking locally. Included were the old favourites at Fraisthorpe, but remarkably came across a pillbox that seems not to have been recorded before - the attached photo probably shows why as its now virtually buried in the dunes! Image 7: Pillbox dereliction, beach. Made a visit to East Hill, Walberswick last Sun. Hard work up there due to the amount of gorse scrub but did come across some anti-landing trenches. Condition varied from some exceptionally well preserved sections in woodland to sections now infilled. Also a few shallow remains of weapons-pits, but need to go back to map these and do a more comprehensive search for others. Image 2: Aerial photo, 1945. 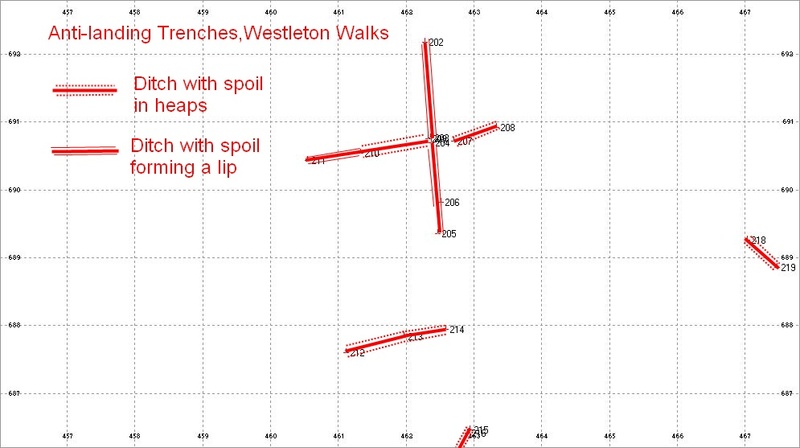 Comparing with the GPS plot shows the extent of the trenches that have been in filled. Freezing fog last Monday did not put me off on getting out, so decided to check out the remains of a Diver Battery in the Walberswick area (the best remains of a Diver Battery I have found so far but that’s for a later post as still have not finished mapping all the remains yet). Anyway, decided to try to get some pics of two pillboxes at Blythburgh designed to house two Vickers MG’s each. They did look quite attractive in the freezing fog but as usual the camera failed to capture the ambiance! I could imagine a German raiding party encountering these two – with four Vickers they could through out 1,000 rounds per minute at rapid fire. At rapid fire, each gun would get through 16 belts of ammunition every 15 minutes (30 minutes normal rate). Would have been a headache to keep these guns supplied in ammunition if invasion had been for real in this area. The photos shows how the guns in these pillboxes would have dominated the ground. One can only imagine the discomfort of the gun crews with the noise and fumes let alone those on the receiving end! The design of the pillboxes seems to be unique to Suffolk. They are shell proof with an L shaped blast wall. As well as these two I only know of the one at Benacre and one at Dunwich still surviving. Image 3: Pillboxes on a somewhat better day! 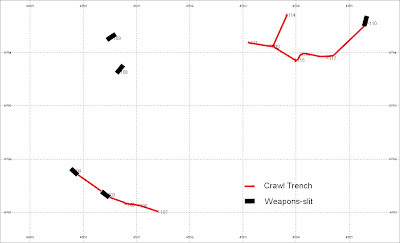 With the short winter days, no time for travelling far so mapped these weapons-slits and crawl trenches at Westleton today. No doubt practice trenches but who dug them? In this area they are few and far between compared to the main training area, so were they Home Guard or Field Forces practice trenches? Not really sure if recording these is of much interest to anyone but I enjoy it and feel there should at least be some record kept. Being at least 65 yrs old, I doubt many will be visible 65 yrs later!! Iamge 2 & 3: Photos of two of the Weapons-slits and trenches - as usual phots of earthworks never quite turn out but if you look hard enough you should be able to make out the crawl trenches and weapons-slits!! I have already posted on the remains of the concrete bases for huts for this HAA battery. However following my last visit to TNA I have found some additional information on the site. It formed part of the Diver Strip, but was not a standard HAA site but known as a 'Welter Site'. The 'TA' series of Welter sites had two 3.7" HAA guns and 11 Bofors 40mm LAA guns. For Diver sites, radar could sweep an area with an arc of 30-110 deg. and had a range of up to 30,000 yards. 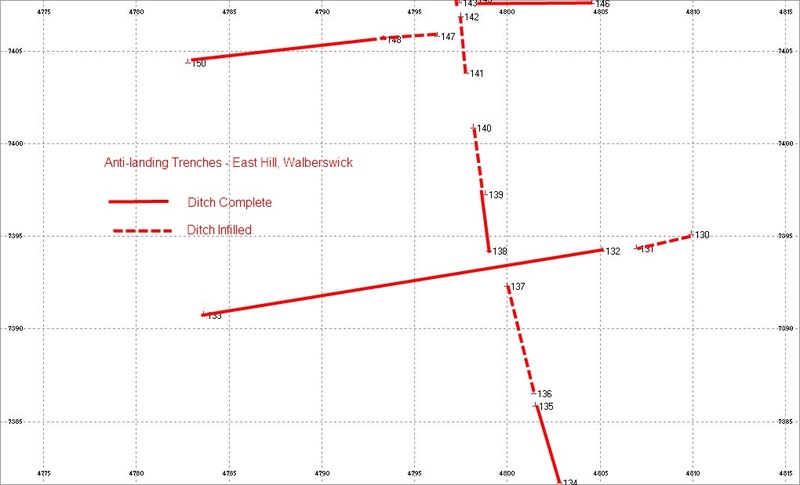 The range that HAA sites could engage targets was 5,000 yards, for Welter sites it was 3,500 yards. Targets picked up on radar would be selected if they were likely to pass through the circle which would put them in range of the guns. 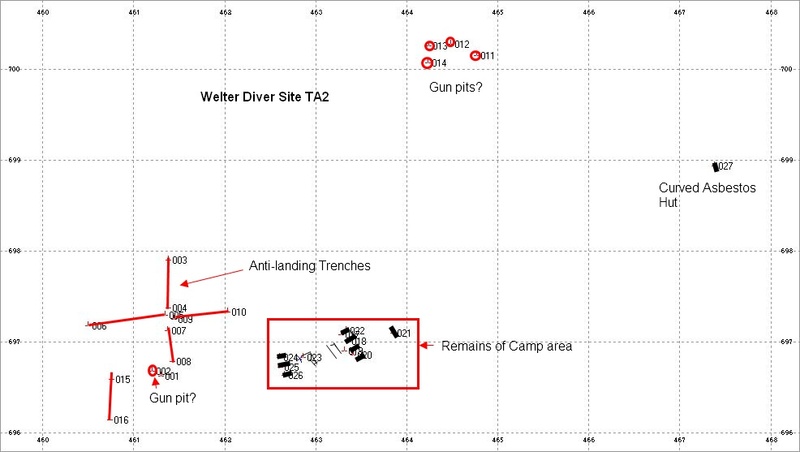 Although I am aware that the layout of most Diver HAA sites was with the four guns arranged in a straight line, I have not yet found any details on the layout of Welter sites (if anyone has any details I would love to hear from you). Above: Layout of a Diver Site (based on aerial photo) with guns arranged in a line with accommodation huts, stores, workshops etc nearby. Last weekend I made a return visit to the site, mainly to map the remaining traces of the anti-landing trenches nearby. These have been in-filled and remain only as depressions. I also came across some large pits/depressions which possibly could be the remains of some of the gun positions. 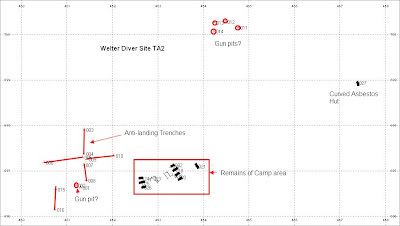 Image 1: GPS plan of remains in area of Welter Site TA2. 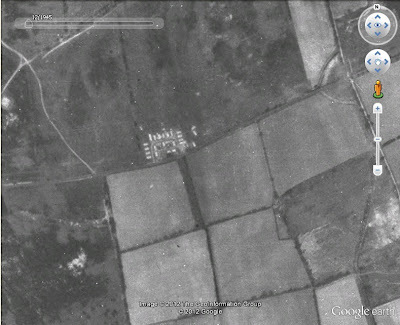 Image 2: Aerial photo of camp, 1945. Image 3: One of four depressions, perhaps remains of gun positions? Following this I had a walk in the area and found another site with a substantial number of practice slit and crawl trenches. so all in all a very productive day! 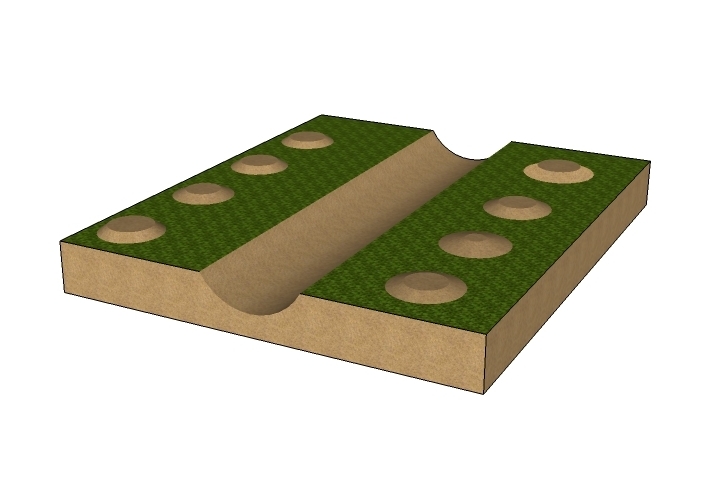 Above: Google sketchup representations of anti-landing ditches. Top is typical with soil in heaps set back from the trench. Bottom shows the spoil placed in 'lips' - the first time I've come across this. In one stretch of trench, it changes from spoil in heaps to a lip mid way. 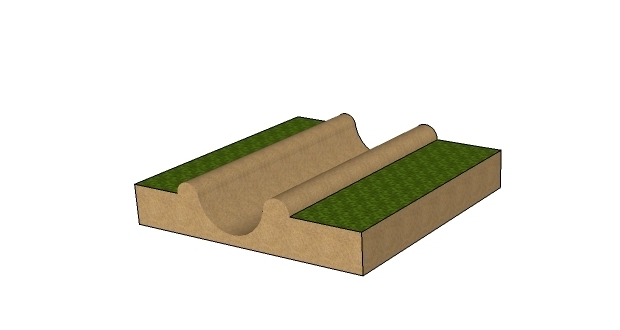 In another stretch, the lip is only one one side for part of the trench, with a much shallower depth of trench along this section. I have an aerial photo of these trenches taken in 1946 (not sure of copyright so cannot post it) and it clearly shows the ditches in this form at least at the end of the War. My only thoughts so far to explain the above is that possibly the usual form (spoil in heaps) was dug by excavator while the spoil in lips sections dug by hand. Maybe the short section with a lip on only one side was never completed (or possibly part in-filled from one side post War?). 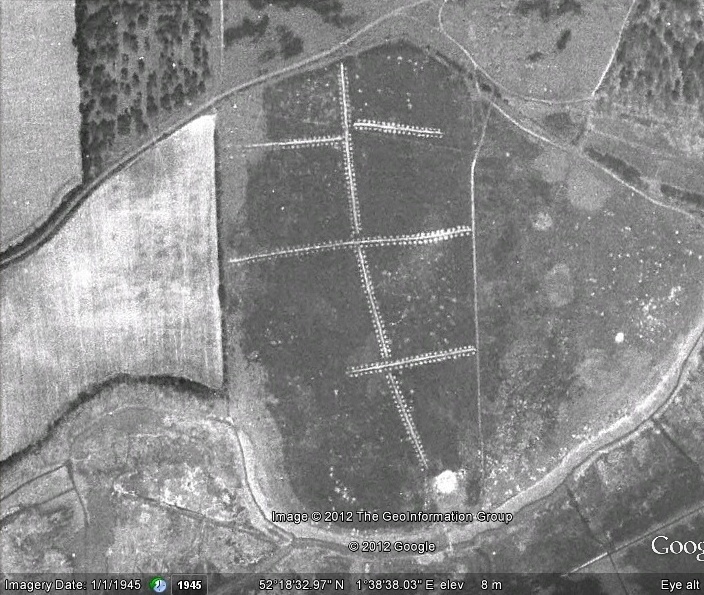 The aerial photo also sadly shows that these are only partial remains of the anti-landing obstacles. 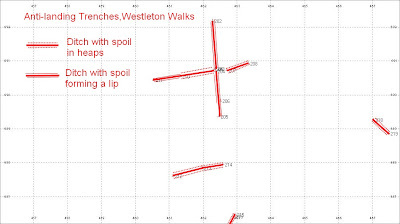 I did come across shallow depressions which I thought at the time may be in-filled ditches - will have to go back at some point and map these and over lay them on the aerial photo to be sure. 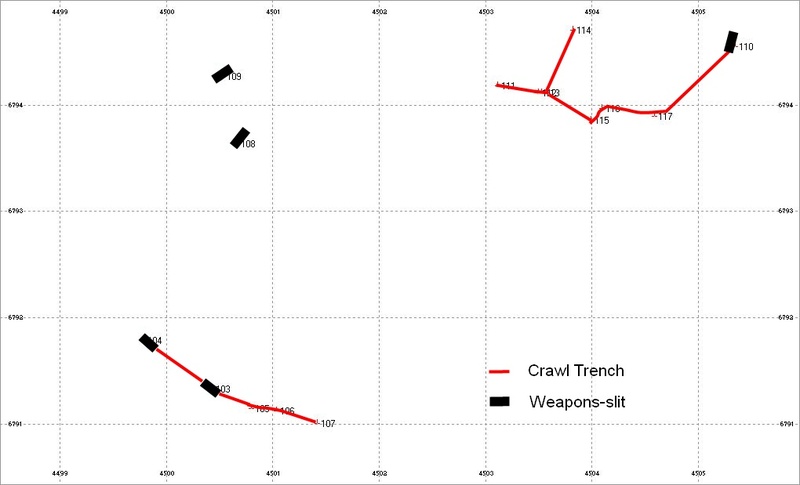 After mapping the ditches, a little explore revealed a typical 6'x2' slit trench and 6'x4' weapons-pit along with a few bits of angle iron and the remains of a 4" mortar round. Also many circular depressions, probably shell holes. The aerial photo also shows what appear to be shell holes. These are the first positive remains I've found for training in this particular area of Westleton Walks to date. For this post, reference is again needed to the above barrage trace. 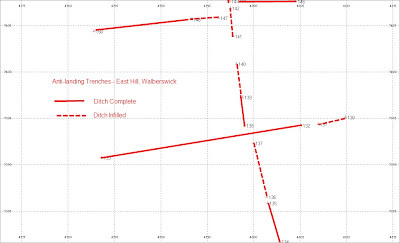 I have added the anti-tank ditch to the trace which I recorded by GPS on the site visit. Note that there are a number of breaks in the ditch – could these be the remains of crossings created by this demonstration? 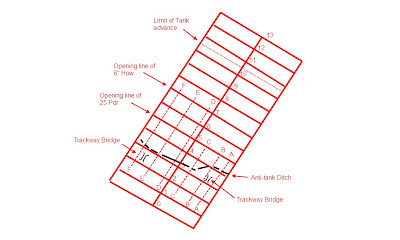 With reference to the barrage map the line AA marks where the ditch was crossed by fascine, line BB a crossing was created by an explosive charge, line CC crossing was by a scissors bridge and line DD, EE and FF crossing was by digging ramps by hand. On the lines DD, EE and FF the second minefield was crossed with the aid of ‘snakes’. Lanes were to be made through the second belt of wire with Bangalore Torpedoes. The third part of this blog looked at the first phase of the demonstration (barrage and creating lanes through first minefield and belt of wire). The second phase of the demonstration was the crossing of the ditch and second bet of wire and minefield. At zero hour two squadrons of tanks of Royal Armoured Corps were to set off and ditch charges and Bangalore Torpedoes detonated. Tanks were then to advance to their objective and take a hull down position to support the infantry attack on the final objective. At zero plus nine the infantry were to set off. Fascines: These were basically bundles of small diameter wood. Fascines were traditionally used for strengthening earth works, revetting river banks etc but were used since at least Roman times for crossing obstacles. 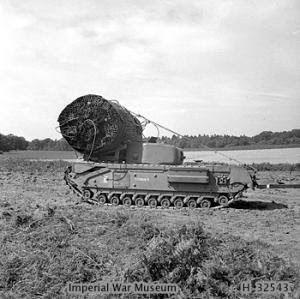 Tanks carried them for this purpose in the First War and the practice was continued in the Second war. I have come across one specification of fascines made from chestnut paling rolled around 2” tubular scaffolding. 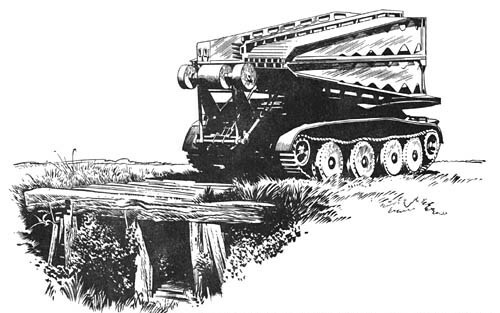 Scissor bridge: a bridge that was transported and laid by a tank (either a Covenanter or Cruiser Mark V). 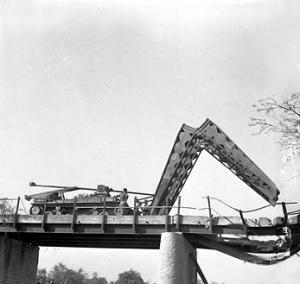 The carrier tank could then disengage from the bridge allowing other vehicles to cross. 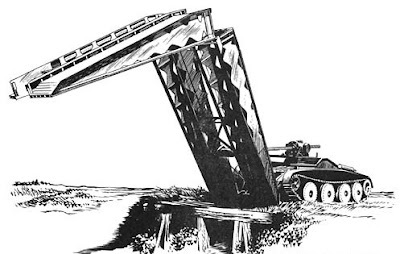 The bridge could span a gap of 30 feet and carry a tracked load of up to 30 tons. Its an exercise showing a river crossing but clearly shows how the bridge would have worked. Bangalore Torpedo: these had also been around since the First War. 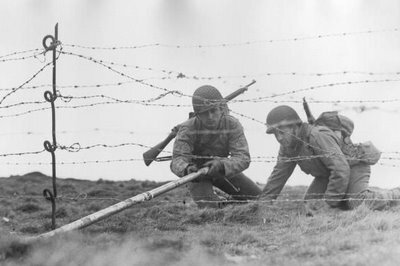 It was basically a prepared charge used for breaching wire obstacles. It consisted of a steel tube of 1.5 inches diameter which was filled with high explosive. It came in six foot sections which could be connected up. A bullet shaped nose was fitted to the lead section to ease the passage of the tube over the ground. It was basically then just pushed under wire obstacles and blown by a detonating cord. The photo show US troops training in the UK with Bangalore Torpedoes. Snakes: basically similar to Bangalore Torpedoes except they were put in place by tanks and used for clearing lanes through minefields. Snakes could be up to 400 feet in length, contained 800 lbs of explosive and could clear a gap 30 foot wide. Unfortunately the one thing lacking from the War Diaries on this demonstration is a report on the outcome and conclusions drawn from the exercise***. Well that’s it on this demonstration for now although I may well return to it in future as I still want to explore the site further for any other remains of training in this area. This post will look at the scenario of the demonstration and the site as it exists today. The War Diaries note that the site for the demonstration was chosen in order to provide a good view point for spectators of the demonstration rather than ground which would be suitable from a tactical point if it was for real. The scenario for the attack was that enemy forces had been driven off 'Grandstand Ridge' and had fallen back to prepared positions on 'Forest Ridge' where they were holding defended localities. 163rd Brigade had forward posts established on 'Grandstand Ridge' and for the purpose of the demonstration, 198th Infantry Brigade was to attack through 163rd Brigade and capture 'Forest Ridge' with a view to driving the enemy out of Tunstall Forest. 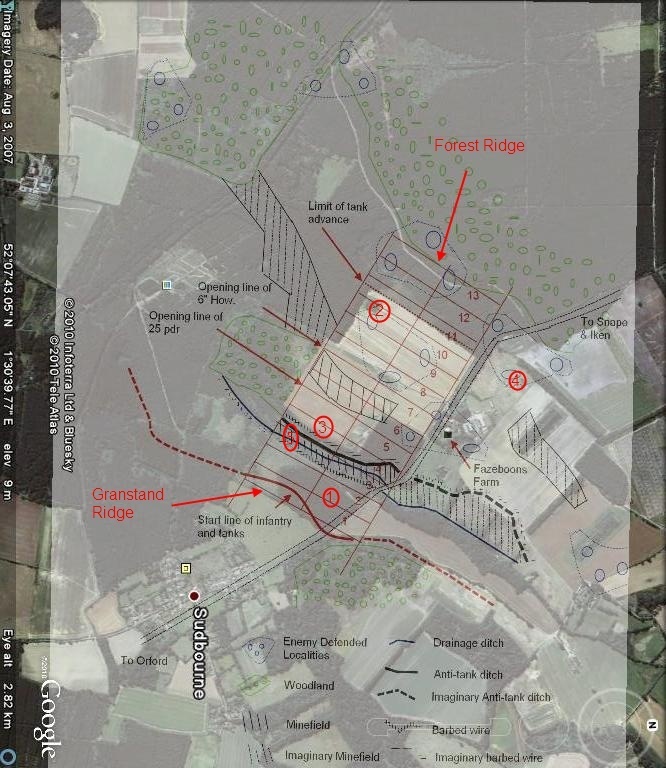 Royal Engineers to prepare crossings over drainage ditch and marking and clearing lanes through the first minefield. Royal Engineers to prepare crossings over anti-tank ditch. 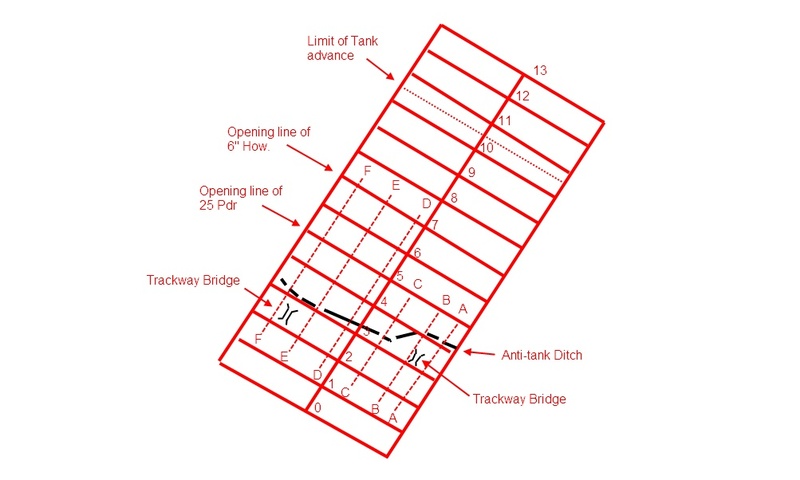 Tanks then to cross start line (with one tank carrying fascine for crossing anti-tank ditch), pass through lanes and use 'snakes' for clearing second minefield. 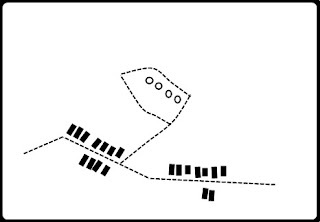 To overwhelm forward enemy posts then occupy hull down positions to cover infantry advance to final objective. Infantry to follow tanks and capture 'Forest Ridge'. 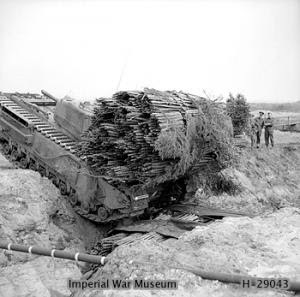 A barrage was to be laid down to cover Royal Engineers in their work in preparing crossings over obstacle and to support the tanks to the second minefield. 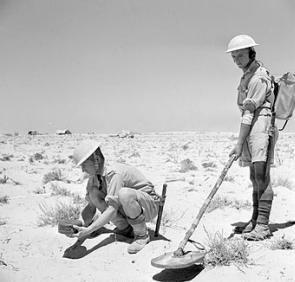 Although the demonstration was carried out in daylight, it was assumed that the work in clearing the first minefield and preparing crossings over the anti-tank ditch took place during the darkness of early morning, troops taking part being issued with dark glasses. The actual 'attack' went in at 'dawn' (actually 1215 pm for the demonstration). 'The first essential in any deliberate attack will almost always be the breaching of those obstacles, natural or artificial, which form part of the enemy defences. To effect this, breaching teams, composed normally of assault engineers and specialized armoured troops, must be detailed, as well as the necessary arms to provide protection by supporting fire and smoke whilst the actual operation is being carried out'. The above demonstration clearly illustrates this statement and in fact it could equally apply to tactics developed by the end of the First War. The pamphlet also notes that the infantry momentum must be kept up and the assault on the final objective would be aided by the fire support of tanks. Next post on this demonstration will look in more detail at barrages, fascines, Bangalore Torpedoes and snakes. 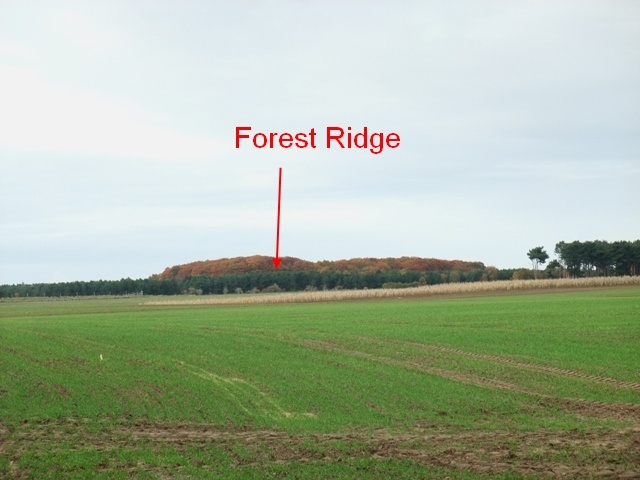 (1) Image taken from 'Grandstand Ridge' looking over the demonstration site towards 'Forest Ridge'. 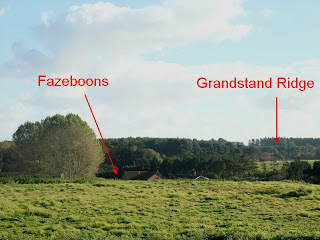 (2) Image taken from the slope leading up to 'Forest Ridge' looking back towards 'Grandstand Ridge'. (4) Part of the 'imaginary' battle field, looking from an enemy defended locality over Fazeboons towards 'Grandstand' Ridge. Briefings for the demonstration were held at Fazeboons.